There are plenty of blog posts out there that give you a great short list of the best items to keep in your pantry for easy, daily cooking purposes. However, if you and your pantry have reached a comfortable relationship it may be time to take things to the next level. Although there are probably way more unique items than the ones I'm sharing with you now, they're still absolutely worth adding to your current ammunition. Having these options, either as staples or for a special occasion, is sure to step up your game in the kitchen. Shallots are the mini versions of red onions but offer a much different flavor. They're sweeter and more subtler in intensity than a red onion but have a bit more of a garlic flavor. I love to use shallots in salads, dressings, and whenever I want something a little less powerful than a red onion. Sesame oil is the only oil that I truly notice a difference in flavor compared to other cooking oils. It's creates a bolder, more savory flavor and is perfect for Asian foods. I use sesame oil in my Green Tea Garlic Ginger Noodles, Lazy Night Stir Fry, and more recipes to fit a specific flavor profile. Miso paste is another Asian cooking staple but is still a versatile item worth keeping in your fridge. Miso paste is made from fermented soy beans mixed with salt and koji (giving it its extra salty taste) and is the base of miso soup broth, like my Vegan Mushroom Miso Ramen. It's also good for adding to salad dressings or sautéing veggies! Vegan mayo was an item I wasn't sure if I should add to this list only because it isn't necessarily anything special. However, it can easily transform salad dressings, dips, and spreads! I used vegan mayo as the base in my Garlic Aioli to go with my sweet potato fries. 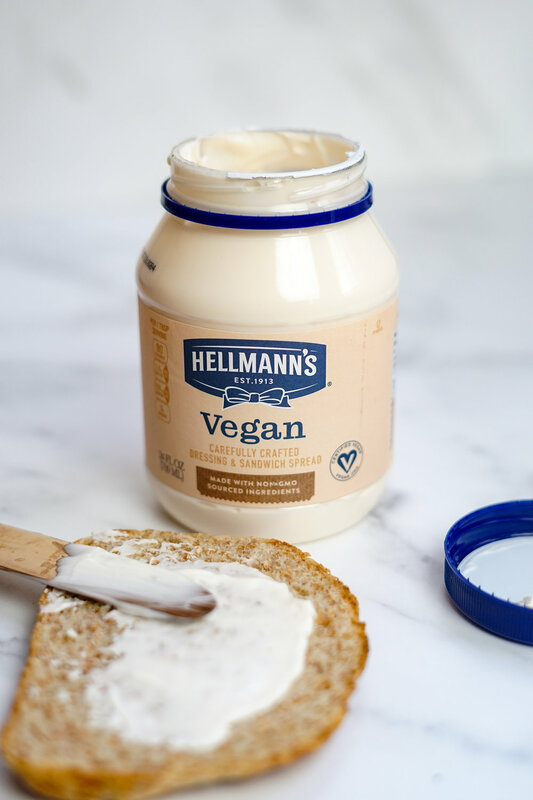 My two favorite vegan mayos out there are from Hellman's and the Trader Joe's Vegan Spread & Dressing (which is really just mayo). Although not the cheapest kitchen staple, it can completely transform your basic pasta dish from college kid to full grown adult with just one pinch of this mouthwatering seasoning salt. Truffle salt is by no means something I'd use everyday (maybe if it was more affordable) but it's still something unique to have as an option. I bought mine from Amazon in a sample pouch which will be more than enough to last me a while. I sprinkled this on my Sweet Potato Truffle Fries to amp up a casual Friday movie night snack to something more special. Sadly I don't mean cheap wine for drinking - we're adults now, we don't drink two buck buck anymore (at least we wouldn't admit it). "Cheap wine" is a relative term in the sense that it's wine you would drink but instead you're going to use in cooking. White wine in cooking is good for cutting sauces that are too creamy, garlic-y, or overly cheesy. Red wine is perfect for sautéing mushrooms, adding to stews, and more. You can actually use either red or white wine to cook pasta instead of water! Garlic is a must in pretty much all cooking. It's gives a punch of flavor that is immediately noticeable and will probably automatically make your food taste better. However, there are times when minced garlic just isn't the right texture for what the recipe calls for. This is where having a paste comes in handy - it's perfect for dressings, sauces, and dips! Keeping a package or two of these at a time in your pantry is a must! Sun dried tomatoes are sweet but still savory and can brighten up a salad, soup, or pasta that's a little too bland with just a sprinkle. Having fresh herbs versus dried or finely ground alternatives will make a huge difference in the quality and taste of your meals. Foods will taste noticeably fresher. If you have a green thumb or at least want to give it a go, I highly recommend buying small potted herb plants to grow yourself. In a vegan kitchen, apple cider vinegar can be one of your most versatile acids. ACV will "curdle" any nondairy milk to mimic buttermilk for pancakes. It can add a tangy flavor to dips or dressings. It's also extremely useful for softening fibrous leafy greens such as kale or chard.